There are many wonderful people doing similar research to mine, and I’ve been lucky enough to work with and receive guidance from several inspirational individuals. My current research is only possible through the assistance of my collaborators, who impress me with their dedication and astound me with their willingness to help me pursue my own work. Dr. Louella Dolar has been a great mentor to me, allowing me to join surveys of Irrawaddy dolphins in the Philippines, supporting my research efforts (both in terms of morale and by including my work in one of her grants), and involving me in the research community in the Philippines and Southeast Asia. Her work has truly inspired me. I am also thankful for the considerable help and guidance of Mavic Matillano (“the Irrawaddy Queen”), with WWF-Philippines; Dr. Danielle Kreb and Budiono, of the NGO Y.K. RASI in Kalimantan, Indonesia; Dr. Lilian Buston Parreno of Guimaras State College, Philippines; and Chalatip Junchompoo at the Eastern Marine and Coastal Resources Research Center in Thailand and Prof. Ellen Hines (SFSU), who leads the Trat Coastal Dolphin Project. Mark de la Paz is a faculty member at University of St. La Salle-Bacolod. He’s helped me with my fisher interviews, and he and his family have helped me with travel logistics and helped me feel at home in Bacolod. I’ve also had several wonderful field assistants (Philippines: Ely, Zion, Ricky, Romeo, Cristela, Archie, Kim, Febricks, Francis, Aisa, Criste, Lloyd, Harold, Christianie, Julz, Angelo; Thailand: Deuce, Gig, Pu, Ake, Pat, Nut, Pong; Indonesia: Raini, Sheyka, Yunita, Jian, Jaya), and many kind and generous folks who have otherwise contributed to my project through their help with logistics and their friendship. Pro Delphinus in Peru, with Joanna Alfaro-Shigueto and Jeff Mangel, on their marine otter project. Community-Centred Conservation, on their project conducting bycatch interviews with fishers along the northern coast of Madagascar. I would like to acknowledge my advisors, Professor Lisa Ballance and Professor Paul Dayton, for their life-changing guidance. Many thanks are due to all of my committee members for their feedback on drafts and presentations over the years. I would also like to acknowledge the additional supportive guidance provided by Professor Stuart Sandin, Professor Theodore Groves, Professor William Perrin, Professor Clark Gibson, and particularly Dr. Louella Dolar. Many thanks are also due to my fellow students in the Ballance-Dayton lab for their assistance, support, and friendship, particularly Summer Martin, Cotton Rockwood, and Trevor Joyce. I would also like to acknowledge those students involved in the Small-scale and Artisanal Fisheries Research Network, particularly Hannah Bassett, Lindsay Bonito, Clinton Edwards, and Ayana E. Johnson. I will always be grateful for the wonderful and numerous members of my research teams: Ely Buitizon, Zion Sunit, Ricky Tandoc, Cristela Oares de Sena, Archie Espinosa, Romeo Borrega, Criste Ferrer, Aisa Tarrazona, Lloyd Fernandez, Harold Janilap, Christianie Cabahug, Julius J.S. Garcia, Angelo Bernandez, Francis Caldito, Kim Doble, Raini, Sheyka Nugrahani, Yunita, Jian, Sanjaya, Darwis, Chalathip Junchompoo, Chatchai Penpein, Deuce Busadee, Lukkana Menketkeit, Natakrittapan Pungsamram, Prathompong Patsom, and Pu. Eira M. Whitty contributed enormously to the success of fieldwork in the Philippines in her capacity as assistant project manager and data monkey. Most importantly, I would like to thank all interview respondents and study site communities, particularly the Tandoc family in Old Guinlo, Philippines, the Torres family in Bago, Philippines, the de la Paz family in Bacolod, Philippines, and the family of Pak Alul in Sangkuliman, Indonesia. Many thanks are due to the Malampaya Sound Protected Area Management Board, Palawan Council on Sustainable Development, Kementerian Riset dan Teknologi of Indonesia, the National Research Council of Thailand, and the provincial, municipal, and village governments at all field sites for permission to conduct research. Institutional Review Board approval was obtained from the UC San Diego Human Research Protections Program for all interviews. This dissertation is based on a foundation build from the kindness and contributions of the following collaborators and facilitators: Dr. Louella Dolar, Tropical Marine Research for Conservation; Marivic Matillano, WWF-Philippines; Alexander Mancio and Ricky Tandoc, Malampaya Sound Protected Area Office; Dr. Hilconida Calumpong, Silliman University; Jessica Pacalioga and Mark de la Paz, University of St. La Salle – Bacolod; Dr. Lilian Buston Parreno, Guimaras State College; Dr. Lota Creencia and Gerlyn Supe, Western Philippines University; Dr. Danielle Kreb and Budiono, Yayasan Konservasi Rare Aquatic Species of Indonesia; Chalathip Junchompoo, Thai Department of Marine and Coastal Resources; Dr. Ellen Hines and her team on the Trat Coastal Dolphin Project. I would also like to acknowledge the attendees of the Small-scale and Artisanal Fisheries Research Network’s international workshop in 2011. 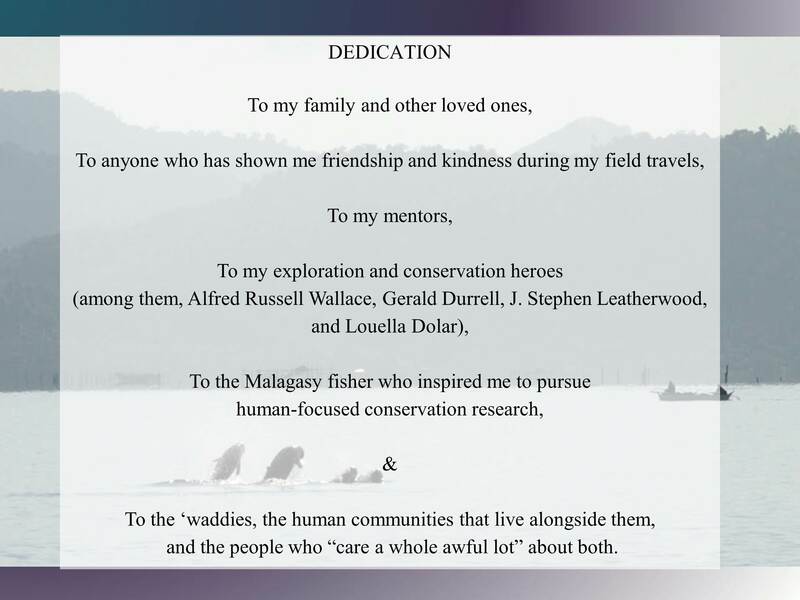 Acknowledgements are also due to the organizers of the Third Southeast Asian Marine Mammal Symposium in March 2013, Dr. Louisa Ponnampalam, Fairul Izmal Jamal Hisne, Dr. Ellen Hines, Samuel Hung, John Wang, Randall Reeves, Katrina Ponnampalam, and the MareCet Research Organization, and to all delegates. Special thanks to Dr. Guido Parra, Gerry Ryan, Dr. Putu Liza Mustika, Dr. Suwat Jutapruet, Dr. Teri Aquino, Cindy Peter, and Anna Norliza for notable encouragement and direct help in providing information on their field sites. Valuable input on social science research was provided by Professor Arielle Levine at San Diego State University, Professor James Eder at Arizona State University, Professor Ratana Chuenpagdee at Memorial University at St. John’s, Professor Richard Pollnac at the University of Rhode Island, Professor April Linton at UC San Diego, Professor Edward H. Allison at the University of Washington, Sarah Webb at the University of Queensland, Professor Noah Theriault at the University of Oklahoma, and Professor Clark Gibson at UC San Diego. Others who provided valuable research advice and information include Dr. Peter Thomas, Dr. Randall Reeves, and Dr. Tim Ragen at the U.S. Marine Mammal Commission; Dr. Nicolas Pilcher at the Marine Research Foundation; Dr. Dominique Rissolo at the Waitt Institute; and Dr. Jeff Moore, Robert Pitman, Dr. Tim Gerrodette, Dr. Dale Squires, and Dr. Dave Weller at the Southwest Fisheries Science Center. Funding for this research came from the U.S. Marine Mammal Commission, National Geographic-Waitt Grants, the Small-scale and Artisanal Fisheries Network, the Fulbright U.S. Student Program for the Philippines, Mia J. Tegner Fellowship for Coastal Ecology, the National Science Foundation (NSF) Integrative Graduate Education and Research Training program at the Center for Marine Biodiversity and Conservation, the NSF Graduate Fellowship, Friends of the UCSD International Center Friends Scholarship and the Ruth Newmark Scholarship, and the UCSD Institute for International, Comparative and Area Studies Travel Award. Funding for my stipend and conference travel was provided by the NSF Graduate Fellowship, the San Diego Diversity Fellowship, the Duff Family Fellowship, the Stout Foundation, the Sustainability Fellowship, the Krinsk Research Advancement Initiative, and the William Menard Memorial Foundation. The UC San Diego Institutional Review Board granted human subjects approval for all interview research. Finally, I would like to acknowledge all other colleague-friends with whom I’ve interacted over the past seven years, and my fellow students, friends, and family who have supported me through this process. Being able to live in the same city as my family has been beyond wonderful, and I will always remember their ceaseless support, even though my work takes me far away from them and doesn’t make the big bucks!